It’s no longer just the elephant in the room but a blazing three-alarm signal: how today do we read Carousel’s apparent endorsement of domestic abuse? The show strives towards a redemptive, healing grace from this toxic portrait of masculinity and female fortitude and subjugation in its wake, as Billy Bigelow, now seeking admission to heaven, tries to make belated amends. It’s both shocking and heartbreaking to watch. And seeing it again now, in post-Weinstein 2018, gives this everyday story of co-dependence and abuse an extra charge. It’s all the more discomforting for the fact that it is all wrapped in the most swooningly romantic and utterly lovely score Rodgers and Hammerstein ever wrote. Jack O’Brien’s production balances these competing, problematic tensions with some grit, playing the dramatic scenes with intense feeling. Jessie Mueller – who last played another abused wife in Waitress on Broadway, but who managed to find her own independence in that contemporary show – brings warm, gorgeous vocal tones to Julie Jordan, and Joshua Henry’s rugged masculinity is complemented by a rich singing voice. The luxury casting of Metropolitan Opera House soprano Renee Fleming, as Nettie Fowler, pays rich dividends in the forever-stirring You’ll Never Walk Alone. 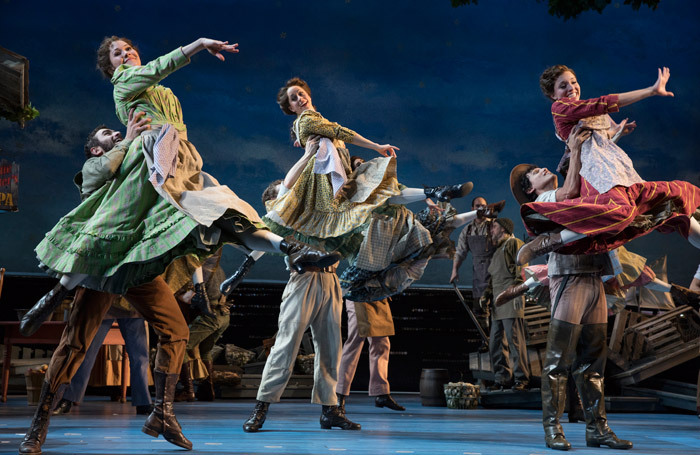 New York City Ballet’s resident choreographer Justin Peck brings two of his principal dancers from that company Amar Ramasar (as Jigger Craigin) and Brittany Pollack (as Louise) to lend an effortless grace to the integrated use of dance throughout, including a thrilling representation of the carousel itself. It is created by the dancers themselves with Santo Loquasto’s rustic, painterly sets only providing a single actual horse.